A picture has been circulating (http://gizmodo.com/this-bison-was-struck-by-lightning-and-emerged-ugly-but-1751814626) of a bison that survived a lighting strike. The thing that struck me particularly was that the bison had red hair. “So what?” you might ask. The answer lies in serendipity – a word coined by the English statesman Horace Walpole in 1754 to describe the art of making discoveries by happy accident. My own happy accident was the discovery, while searching for something entirely different, of an article about the effect of lightning on a piebald bull. The article was published in the prestigious Philosophical Transactions of the Royal Society, which recently celebrated its 350th anniversary as the oldest scientific journal in the world. The publication date was 1776; twelve years before Captain Arthur Phillip sailed into Sydney Harbour to establish the first convict settlement right next to the site of the present Sydney Opera House. The communicants were a landscape painter and a landed gentleman, who contacted Royal Society Fellow William Henly (an expert in electrical conduction and inventor of a novel electrometer) with two extraordinary and very similar tales. The painter told of a bullock belonging to a local farmer “pyed, red and white” (the bullock, not the farmer) that had been struck by lightning, which had stripped off all of the red hairs, but left the white hairs intact. The farmer said that he had seen something similar on a previous occasion. Whether his memory was accurate or not, there was no doubt about the present observation, and the artist even promised to send a drawing to add to its verisimilitude. 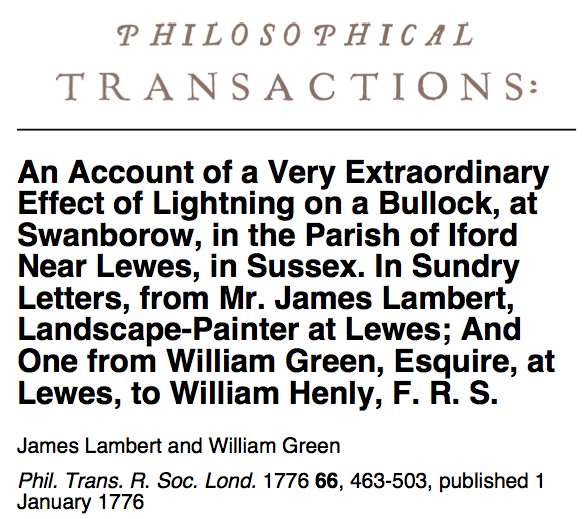 The gentleman’s account of lightning striking a piebald ox was rather similar. Some correspondence followed, where others added their observations, but Henly could offer no satisfactory explanation. Two hundred and forty years later, neither can I. When I first came across this article, I contacted lightning experts, protein biophysicists (hair is composed of the protein keratin), trichologists and others, hoping that might know of some physical difference between red and white hairs that would account for the effect. I even measured the conductance of the two types of hair myself. No luck. There was no significant difference in the conductivity (not that this would particularly matter at such high voltages) and none of the experts had any useful suggestions. But the case of the red-haired bison has rekindled my interest. At the very least it suggests that, with all the supposed (http://metro.co.uk/2014/02/26/14-pros-and-cons-of-having-ginger-hair-4323111/) and actual (http://www.livescience.com/39095-redhead-health-risks.html) disadvantages of having red hair, there is one possible advantage – you are less likely to die if stuck by lightning. Aware that some people may have problems with their maths, Dr Fisher plans to give people more user-friendly information.